← Will it Ever Go Away????? The summer officially arrived yesterday and it was celebrated for the 107th time in the State of Alaska with an annual baseball event in the Alaska Baseball League. The Alaska Baseball League is composed of many of the elite college players in the country, predominantly from the west coast. This might well be the best baseball tradition in all the game. It started in 1906 and since 1960 it event has taken place in the same park. Growden Park in Fairbanks Alaska. The first night game in major league baseball was played on May 24, 1935 at Crosley Field in Cincinnati. Prior to that there were some minor league games played under “artificial illumination” in the 1920s. 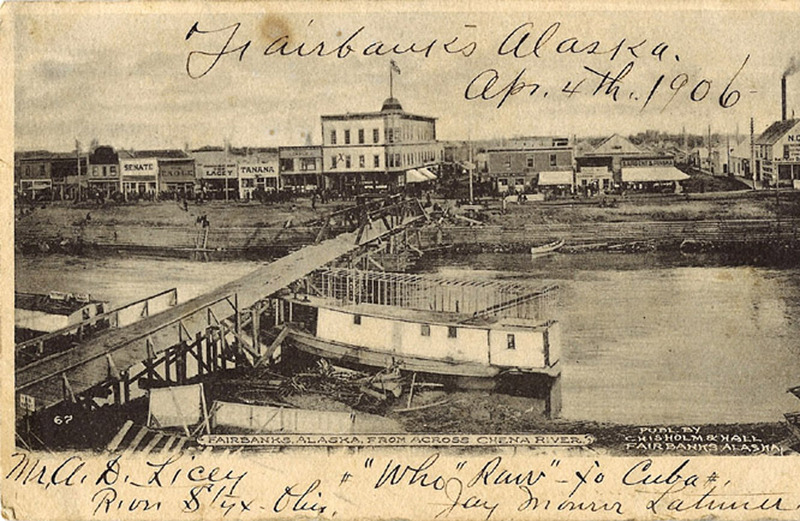 However in Fairbanks Alaska, the tradition of night baseball dates all the way back to 1906 and the best part is though they begin at 10:30 PM, there are no lights needed, for in the land of the midnight sun, there is no night. The Fairbanks Goldpanners have been the host team since 1960 and the Panners are 41-11 since hosting the game every year. With a 10:30 start, the game is assured to go well past midnight and in the first between innings break after midnight, the Alaska Flag song is sung by all in attendance. There is a Red Sox flavor to this game which has included players who have gone on to play for the Sox. Bill “Spaceman” Lee played for the Goldpanners in 1966, ’67’ and believe it or not in 2008. In 1967 Lee was 5-2 with a 2.25 ERA and in 29 at bats he hit .483 with a homer and 6 RBI, pretty good stick for a pitcher. The 1967 version of “Goldpanner” pitcher Bill Lee. Lee was the starting pitcher in the Midnight Sun game of 1967 coming up on the short end of a loss to Japan’s Kumagai Gumi 10-3. However Lee was back on the hill for the 2008 game at the ripe young age of 62. Lee pitched from 1969-1978 with the Red Sox going 94-68 in ten seasons. He won 17 games in each of the ’73’, ’74’ and ’75’ seasons. He went six innings in ’08’ and was the winning pitcher in a 10-6 victory over the Southern California Running Birds. A teammate of Bill Lee’s on the 1966 Goldpanner’s squad was another left handed pitcher by the name of Tom House. Hank Aaron and Tom House. Tom House grabbed his piece of immortality when on April 8, 1974 he was on the receiving end of Hank Aaron’s 715th career home run. He caught that historic blast in the Atlanta Braves bullpen. Eight years earlier Tom was the most valuable pitcher for the Fairbanks Goldpanners going 15-2 with a 1.31 ERA. He struck out 171 hitters in 137 1/3 innings pitched that summer Alaskan season and in 1967 he was the Braves third round draft pick out of the University of Southern California where he was also a teammate of Lees. Bill Lee standing in the back, fourth from left and Tom House (80) kneeling in front of him. House and Lee were reunited in 1976 and ’77’ at Fenway Park when Tom pitched out of the Red Sox bullpen for two years. There is another Red Sox connection with the Fairbanks Goldpanners and frankly it is a connection that is often overlooked and even forgotten and it involves this man. Hall of Fame pitching George Thomas Seaver, “Tom Terrific”. It is often forgotten that Tom Seaver’s career ended in a Red Sox uniform, but more on that in a minute. In 1965 Seaver was the starting pitcher in the Midnight Sun game beating the USC Trojans (his college team)4-3. Tom pitched two seasons with Fairbanks flipping a couple of no-hitters while there. Now back to the Red Sox, Tom was acquired by the Red Sox from Chicago during the fateful 1986 season. He pitched his last game on September 19th and a knee injury ended his season and his career. I am convinced that if the Red Sox had Seaver in the 1986 post season, they would have won that World Series. Hmmm, I remember my Dad used to say “yea, and if the dog hadn’t stopped to S#%t he would have caught the rabbit”…..Maybe it’s time I just let that go. Last night, in the land of the Midnight Sun, the summer officially arrived, and yes “It’s Summertime, Summertime, Sum, Sum, Summertime” and the Sox won their fifth in a row last night at Fenway. Bring on the Dog Days! And so it is on this day in Fenway Park history, summer’s first of 2012. This entry was posted in Fenway Park Baseball, Fenway Park Other and tagged 1912, Bill Lee, Fairbanks Alaska, Fairbanks Goldpanners, Fenway Park, Hank Aaron, Midnight Sun Game, Red Sox, Tom House, Tom Seaver. Bookmark the permalink. Okay, this post took a lot of research and makes a lot of connections, so if you are a fan, this is a great post. I’m sorry I hadn’t found it until today, but better late than never. I never would have guessed … but probably should have … that the first baseball night games were in Alaska where you don’t need lights at night because in the summer, in Fairbanks, there is not night. I am so sorry I didn’t find your blog until today. On the up side, there’s a lot in here for us to enjoy and catch up on. My husband in a committed baseball and Red Sox fan. His love affair with baseball started with the Brooklyn Dodgers and he has been faithful through the years. He knew Sherm Fellers and commented that Sherm must have written “Summertime” in one of his rare sober moments. Thanks for a great piece of baseball history and writing. Thanks Marilyn… GREAT to have you on board!!! A fan of Dem Bums I LOVE IT!!! The Sandy Koufax Story by Arnold Hano was the first real book I ever read! I hope he enjoys traversing my stories!!! Hi, Raymond. This is really “good stuff” (as the wonderful scribe and sports journalist, Clark Booth, would say). I’m a life long baseball fan, dating back to the Brooklyn Dodgers. Duke Snider was my first baseball hero. I’m retired after 40 plus years as a TV and radio newsman. Long story short, my career eventually led me to Boston and the Red Sox. So, I remember young Tom Seaver with the Amazin’ Mets and old Tom Seaver with the Bosox. Thanks Garry, I’m a big fan of Clark Booth AND I saw Seaver’s last start at Fenway! I was a tshirt vendor “on the bridge” from 82-86. So glad you enjoyed it! Raymond (can I call you Ray? ), we must’ve bumped into each other at some point at Fenway. I miss the days when I could just show up and Johnny Pesky would greet me and share some stories. Back in ’70, I was doing a Walter Mitty series which included a stint working out in uniform with the Sox. Bob Veale threw batting practice caught by a rookie named Fisk. Veale had an evil look as he cut loose with his fast ball which still had plenty of gas. I could hear kid Fisk giggling as I swung with great futility. It made for great television. Let’s keep this going…(I sent your piece to Steve Buckley of the Boston Herald. Steve’s a nice guy and wonderful writer). Very interesting. Glad I stumbled on your blog!